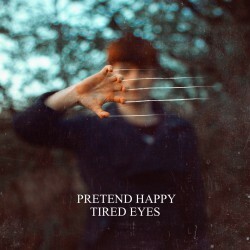 Alt-emo trio Pretend Happy release their debut album Tired Eyes on 8th February via Tape Culture Records. Hailing from Barnstable and formerly known as Framework, Pretend Happy create a fantastic sound that marries elements of punk and grunge with an overcoat of emo. Even though the year is still in its infantile stage, one thing is clear Tired Eyes is not only an essential listen but will surely go down as one of the best albums released in 2016. It’s a big statement and one that we’re 100% confident is accurate. Tired Eyes is an immensely powerful and commanding album; it’s something that you’d expect from a band on their 3rd or 4th release – not a debut. Crucially it’s the sound of a band that have carved out their niche and found a sound that they are not just comfortable with but one that they excel in. There’s not a single weak track here. From the short and introspective sounding opener of ‘Sink’ right through to the thunderous and soaring riffs of closer ‘Dirt’, Pretend Happy hit all the right notes cumulating in ten perfectly formed and thoroughly enjoyable tracks. ‘Hellp’ is an infectious and immediate track that gets the blood bubbling and pushes you towards the thought that you’re listening to something special. It sets the bar for what happens in the rest of Tired Eyes, big emotive rock songs that have a commanding presence and potential mass appeal is the order of the day. Title track ‘Tired Eyes’ delivers up more of the same, conjuring up a likeness to Hindsights. ‘Save Me’ takes a lighter and more refined tone, at times it touches on the beautiful while at others (when the chorus kicks in) it comes out sound like some of the most emotive and life affirming music (despite the slightly bleak lyrics) committed to record in recent years. It’s on ‘Iced Teeth’ though that it’s confirmed that Pretend Happy are something truly special. It’s the kind of track that has emo / alt grunge hit written all over it. There’s a distinctive Mid Western American sound with a more immediate edge that strikes a chord emotionally and leaves a lasting impression. ‘I Remember’ has some wonderful riffs interspersed between the down beat lyrics, while ‘I’m Home’ goes for the more raucous and commanding approach. ‘Turnover’ goes down as another ludicrously high point of the album. Again it’s awash in alt grunge and emo sounds with spikey punk energy that suckers you in and engrains itself upon your subconscious. ‘Arsonist’ is a beautiful heart wrenching track, before album closer ‘Dirt’ drives home the fact that Tired Eyes is an astounding album. Just try to not sing-along. Pretend Happy have made a formidable announcement with Tired Eyes. They have the potential to become your new favourite band, the album grows and grows with every listen becoming more and more relatable and astounding. Superb stuff.